Soviet military doctrine proceeds from the assumption that the imperialists are preparing a surprise attack against the USSR and other socialist countries. At the same time, they consider the possibility of waging military operations escalating into military actions involving the use of nuclear missile weapons. What struck me about this passage are the assumptions it makes and the consequences of those assumptions. The Soviets assume we are the imperialists and will strike first. Would we want to forestall such an occurrence and strike first ourselves? Perhaps we should. Naturally, we would object to being called the aggressors in the Cold War. From our perspective the Soviets showed their true colors in the closing days of W.W. II when they kept for themselves territory they took from the Germans. But, if the Soviets thought that we would strike first, they might consider striking us first to prevent it. Should we then strike them pre-emotively to prevent the Soviet’s pre-emptive first strike to forestall our first strike? It all seems like a bizarre vaudeville routine, or one of Shakespeare’s mistaken identity comedies. Nuclear weapons are of course very real, with extremely real consequences for their use. I call it the Madman Theory, Bob. I want the North Vietnamese to believe I’ve reached the point where I might do anything to stop the war. We’ll just slip the word to them that, “for God’s sake, you know Nixon is obsessed about communism. We can’t restrain him when he’s angry—and he has his hand on the nuclear button” and Ho Chi Minh himself will be in Paris in two days begging for peace. 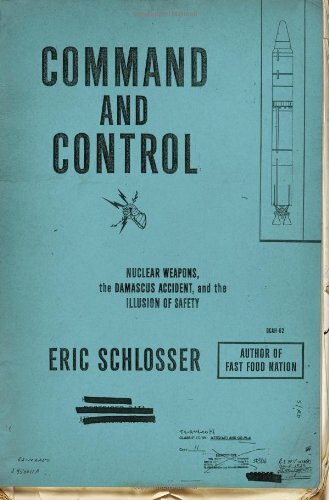 Eric Schlosser’s excellent book Command and Control gets at the heart of both the reality and unreality of the existence of nuclear weapons. A brief example . . . The Titan II missile carried a destructive power 3x greater than all the bombs dropped in W.W. II combined . . . including those dropped over Hiroshima and Nagasaki. But the weapon wasn’t very accurate, and very difficult to keep properly maintained. Still, because these weapons were our most powerful they had potentially significant deterrent value in the Cold War. So that meant that they needed to be ready to go on a moment’s notice, as their silos would likely be some of the first hit in any massive first strike by the Soviets. That in turn meant that they needed to be fueled and ready to go at 15 minutes notice, which meant they needed a special kind of fuel, Aerozine -50 . I can’t imagine a fuel more volatile, as contact with leather, wool, rust, or other average products could cause it to combust. That made the missiles prone to accidents with potentially horrifying consequences, and one such accident forms the backdrop of the book. By the 1970’s Henry Kissinger, among others, wanted to make a deal with the Soviets. We’ll get rid of our Titan II’s, you get rid of your big missiles. But our Titan II’s were not as good as the Soviet’s comparable missiles, and the Soviets knew this. No deal. Kissinger wanted the Titans gone, but no one wanted to decommission them outright. To take the missiles offline for nothing would show weakness, and lessen the amount of bargaining chips we had the next time we negotiated. But if they stayed, they needed to stay operational or it would be the same as giving them away for nothing. So . . . no one liked the inaccurate, accident-prone, massively powerful weapon, but in the logic of departmental budgets and global politics, their silos stuck around. As a friend of mine put it, a conspiracy of circumstances made madness look sane. In a world where the image/symbolic value of nuclear weapons may have meant more than their reality, Kissinger’s stance makes perfect sense. Indeed, as much as we might like to blame someone for this state of affairs, who would it be? Even if we step all the way back and blame those that invented the weapons, we must then confront the possibility ca. 1941 that the Nazi’s might be building them, and we might want to get there first. We all stepped through the looking glass more or less together from the Manhattan Project onwards. When I first started this book I looked online at “nuclear weapons accidents.” I was utterly dumbfounded. How could there be so many? And given these accidents, how did nukes play such a large role in our policy? This forms the bulk of Schlosser’s work. Command and Control could have been just a laundry list of one accident after another, and readers would be mere gawkers on the roadside. Schlosser makes the book valuable because he looks behind the curtain (with massive amounts of footnotes) to show how the logic of nuclear policy developed. At the heart of our possession of nuclear weapons lay a dilemma. On the one hand, the weapons posed great dangers not just to those on whom it might be used, but to those who kept them. Accidents happen, so naturally we should take great precaution to make sure we don’t have a nuclear accident. So far well and good. But the more safety restrictions one put on the weapons, the harder they became to use. If they became too hard to actually deploy, they had no deterrent value. If the weapons existed accidents would happen. But how much effort should we put into preventing accidents if each safety measure made them less valuable as an actual weapon? And again, if they didn’t function as weapons, deterrence broke down and the world became less safe. Different aspects of society had different opinions on this. Scientists stressed safety, the military stressed the efficacy and availability of the weapon. For example, a congressional committee reviewed security at Minutemen missile sites and found it lacking. They mandated that access to the missiles be granted only with proper code identification. The Air Force didn’t like it. In event of an attack they would need quick access to the missiles, and who could tell who might need access if the normal command structure at the base broke down? But in the end they complied with the congressional order. They made the codes for all Minuteman sites 000-000-000. Having a ready made deterrent also meant that we needed a lot of nukes in the air on planes, especially in the first 20 years or so of the Cold War. Before we developed rockets and guidance systems the only way to get deliver the weapons was through planes. The planes had to have the range to stay in the air long enough to get deep inside Soviet airspace. This meant extensive use of the B-29 bombers, planes with a wobbly safety record. The record is actually not that wobbly on paper, but we must factor in that these planes had to stay in the air constantly in case of surprise attack by the Russians So if you expect a mishap once every 10,000 mission hours, that small number adds up quickly. Every time a plane crashed or caught on fire meant a potential nuclear disaster. Sometimes bombs got lost, sometimes they exploded, scattering radioactive material. Sometimes the fact that the nuclear material did not detonate itself may have been a matter of chance. Can we blame someone for this? In my opinion, not really. Accidents happen as part of life, sometimes no matter the precautions, and this means that nuclear accidents may be inevitable. But there can be no doubt that the logic of the Cold War itself, along with departmental budgets, made accidents more likely. For example, when various people or agencies raised safety concerns often little got done. Acquiring new weapons was always preferable to fixing old ones, and this makes sense. But rarely did older weapons get discarded. More often than not, Kissinger’s logic mentioned earlier kicked in (of course this went way beyond Kissinger himself). Yes, the Cold War and Mutually Assured Destruction no longer form part of the strategic calculus. But Schlosser points out that the weapons still exist, and we must still deal with them. To do so we must bring them firmly into reality. One can’t help but wonder that if things were this bad in the United States, what were they like in Soviet Russia? What about places like Pakistan today? Amidst the confusion of alternate reality created by nukes, one things seems clear to me: the fact that we have yet to blow ourselves up must be evidence that God exists, and that His mercy endures forever. This entry was posted in 11th Grade, Book Reviews.